There is a database (or any kind of data store, such as files or XML or whatever), and an application that operates on the data. 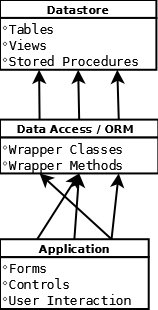 This gets rid of the data usage and access problem: changes to the database structure are mirrored into the data access layer, and will cause compiler errors if a table or field has been removed or its data type has changed. 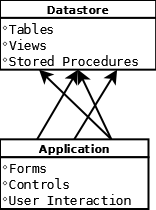 Still, the problem of implementing business functions in the database or in code remains, and the application needs to be aware or where the function is located. 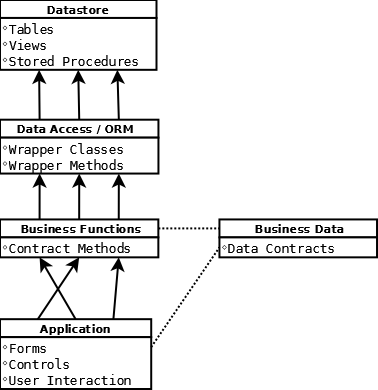 The business layer encapsulated business logic wherever it is implemented, calling either business function in C# (object-oriented) or in the database (taking advantage of set-based operations or database-specific functionality). 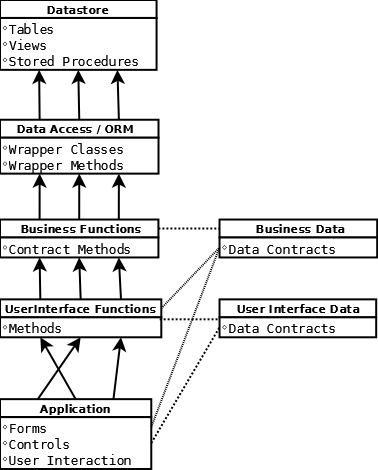 The application exchanges data with the business layer using the data contract classes. As I mainly develop web applications, I notice that the object-oriented model occasionally breaks down in the front-end, since HTML is basically all-strings, and you need to parse and re-create your data access objects based on HTML data. Further, if you need to let your users edit hierarchically-structured data, you’ll soon get lost retrieving all your hierarchical business objects. Notice that, although I have a strong background in MS development tools (Visual Studio, SQL Server), I tried to keep the ideas and diagrams as technology-agnostic as possible. It does not matter whether your business functions reside in a web service (of any kind) or just in a separate library (assembly), or what database (if any) you use. This entry was posted on Friday, October 28th, 2011 at 9:15 and is filed under all kinds of everything, Software Architecture. You can follow any responses to this entry through the RSS 2.0 feed. You can leave a response, or trackback from your own site.